How does Morningstar Boats make its aluminium boats? Has Chinese boats manufacturer Morningstar Boats done the impossible? 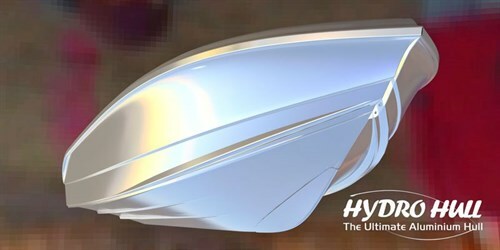 Its aluminium boats ride and are constructed as well as any fibreglass hull. MORNINGSTAR BOATS: DOING THE IMPOSSIBLE? Morningstar Boats began as a venture when entrepreneur Ian Wang discovered he couldn’t find the perfect aluminium boat. He figured the best way to get there was to do it himself. Ian enlisted the expertise of William Fan, who runs a very large car panel manufacturing facility, and marine architect Troy Munnery. Since then, Morningstar Boats has poured millions of dollars into development and tooling, including pumping out 150 test hulls before achieving success. In the initial stage, aluminium product was sourced from four continents before deciding on Australian Alcoa 5083 sheet, which best withstood the stress of the forming process. While a press is used in the process, simply describing the shaping method as ‘pressing’ might be a little misleading because the die for the different components cost $1.3m and the monster press exerts 4000kg of pressure that gives the aluminium the fluidity needed to achieve the complex shapes. An additional difference between the Morningstar boats process and the traditional concept of pressing is that the sheet is held in place at the edges while the stretching and forming process takes place. For the technically-minded, Ian advised that during the forming process the crystal lattices of aluminium alloy are squeezed. That decreases the size of lattices and increases the contact surface and friction between lattices that, in turn, increases the strength of the alloy plate. Compared with the dies on pressing conventional hull plates, the dies for forming have binders that hold and release the alloy plate gradually during the pressing process. This helps control the plate being stretched evenly along the shape of the dies. 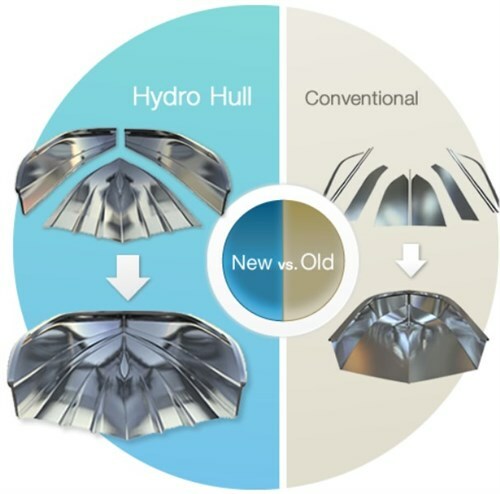 Once formed, the hull components are welded together to become extremely rigid and strong without the need for ribs along the sides as seen in traditionally-pressed hulls. Following the release of the original side-console model, the company has been developing variations of the layout in the 4.6m hull and the range now includes a cuddy, a runabout and a centre console. The take-up of Morningstar Boats has been swift in Japan and China, where government departments have embraced the design. Sydney dealer Enterprise Marine has seen gradual acceptance, with all shipments finding a home and forward orders looking healthy. Australians are slowly warming to the brand, after initially questioning Taiwanese boatbuilding prowess without realising that country has been producing quality and very capable large cruising yachts for years. Pics via morningstarboats.com unless otherwise noted.